An Unexpected Gathering is one of the most iconic sets within the LEGO Hobbit theme. It's seen in both movies, and everyone loves the thought of building and playing with a LEGO hobbit hole. 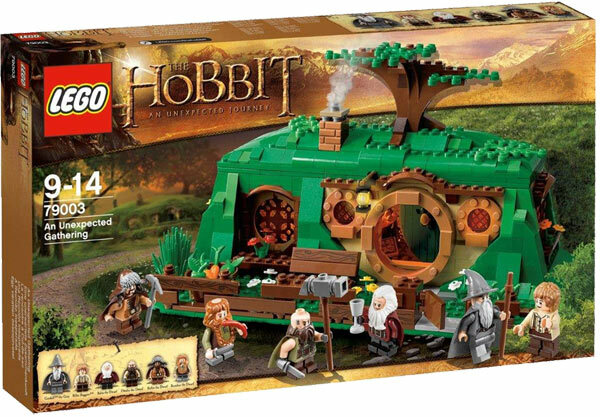 This is a set that all LOTR fans and Hobbit fans alike will want to have in their collection. That's our unique parts list. Now let's take a look at the minifigures. First of all we have the same old Gandalf that we see in four other sets. An average minifig in my opinion, however, he is quite iconic. Bilbo looks like an average minifigure, yet we are told that there is more than meets the eye in this minifigure. Now Balin, who we find an essential dwarf in the Hobbit, and we also see his skeleton in LOTR. Probably one of the best minifigures in the set, and everybody loves a minifigure that is a dwarf and looks like Santa with overgrown hair and a cape. Next we have Dwalin, Balin's brother. He does have a unique cape, which only has one hole in it, instead of two. Then we have Bofur the dwarf. In the book he was hardly mentioned, but in the movie he's the comic relief. Bofur is currently exclusive to this set, and has a brand new hat piece. My only complaing about Bofur is that his cape pushes up his hat, and the hat easily falls off. Next up is the pudgy dwarf. Bombur (like Bilbo) does not have a cape. Bombur has an enlarged stomach attached to his hair piece. The bald spot on his head is also attached to his hair piece. Overall, we have some great minifigures in this set, with five being exclusive. An Unexpected Gathering is a set that just screams: "PULL ME OFF THE SHELF AND PLAY WITH ME!!!!" The roof is removable and there is no back, which allows for tons of excessabillity, making this set one that is meant to be played with. There's tons of food and great play features. At retail, the PPP is $0.11. Let's take a look at how much you can make by parting this set out. That adds up to $33.00. The set without minifigs is going in between $30 - $40. That adds up to $68.00. With a current asking price of $55.00, that would be a way to make $15.00. If I found this set for a good deal, I'd probably take a shot at parting one out. The LEGO Hobbit theme has proved very popular, and I think that will help tremendously after retirement. Nothing exclusive about this set. You can probably find it at your Target or Walmart. An Unexpected Gathering has some great packaging. It makes you feel like you are looking through a window into the Shire. Another great thing about the packaging is the size. The box is very thin, and there is not as much empty space as in sets like the 10224 Town Hall. This makes it easer to ship. This is probably the most iconic set within the Hobbit theme, and I have a feeling that this set will exceed the expectations of many people. With five exclusive minifigures, great playability, fabulous display value, and intricate details, this set will be a winner. I see this set jumping to $90.00 after a year of retirement and having an average CAGR of 35%. I don't see people talking about this set much, and now is probably the time to bring this set to the spotlight, considering that lego.com just discounted The Goblin King Battle. It probably won't be long before this set is discounted on lego.com as well. This set looks fabulous from the front. It's easy to dust, has a straight forward design, and will make a fabulous display on a desk or table. The only thing I don't like is the extended floor. It looks out of place. The rest of the set is amazing, and most people probably won't be looking at the back of the set. This set is a definate winner. I hope to pick up a few before it retires. I have a feeling that this will be one of those "hall of fame" sets that will be talked about as a great investment that everyone wishes they had more of back in storage. Considering every bit of evidence, this will be a set that you won't want to miss out on.